Curbar Gap the pay and display car park provides a picnic area and access to the grit stone edges of Baslow and Curbar. Curbar Edge sits well above the villages of Calver and Curbar the River Derwent thus providing spectacular views. It is a popular destination for walkers who love to explore and there are over 200 climbing routes along the edge attracting the climbers. Curbar Edge leads on to Froggatt Edge. The small stone circle on Froggatt Edge is also known as Stoke Flat Circle it consists of eleven typical small Derbyshire stones no more than half a metre tall except one which is just over a metre. The stones seem to form a double ring and the whole structure measures about 14 metre in diameter, some of the stones can be hidden by the ferns in late summer. White Edge, which borders Big Moor, is more remote and sees fewer walkers but has panorama views in every direction. The trig point provides a great place to spot red deer across the expanse of Big Moor with the redundant Barbrook reservoir in the distance. Red deer are the UK’s largest land mammal and sometimes all you can see are the stag’s antlers sticking up above the heather. Many corn and textile mills were sited here. These three grit stone edges were once extensively quarried for their rough, course stone. Remnants of discarded round millstones can be found around the edges giving the stone its common name, millstone grit. We take the path at the side of the seat that leaves the free lay-by near Cubar Gap car park. We head steeply uphill to reach Curbar Edge. At the top we turn left and just keep following the edge which eventually becomes Froggatt Edge. We pass the Stone Circle on our right and then go through a gate. We keep heading forwards through the trees until we meet the road. We turn right and almost immediately we cross the road to go through a gate. We head downhill cross over a stream and into the pay and display car park. At the end of the car park you can turn right and then left along the road to the Grouse Inn OR as we do turn left into the trees and follow the wall on our right to avoid the road. After a short way we turn right through a gate stile and then through the next gate stile opposite. We now head across the field to the Grouse Inn. We go over the stile turn left along the road in front of the pub then take the path on the right through the gate. We bear slightly left across the field to the trees. We go through the gate and turn right uphill. At the signpost we turn right, this brings us out into the open and we head uphill following the wall on our right. At the signpost for Curbar Gap we turn right onto White Edge. We now keep heading forwards following the path along the edge. Keep your eyes open for red deer. Eventually we pass the trig point on the left and keep heading forwards. We soon start to go downhill to meet a wall and the end of the field system we turn right downhill following the path with the wall on our right. We cross a tiny stone bridge over a stream at the bottom then head uphill to Curbar Gap pay and display car park. We now turn right and follow the road downhill back to the lay-by where we parked our car. 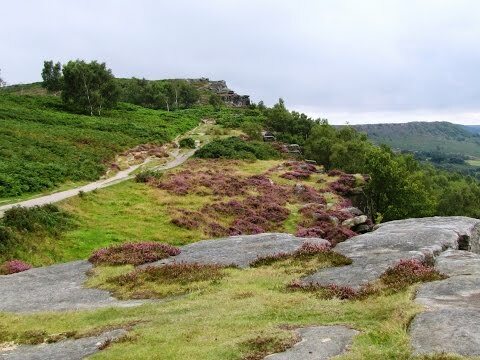 This is an easy walk on good tracks and paths with gentle inclines and declines but one steep lift to start with onto Curbar Edge. Approx 6 miles allow 3 hours using OS Explorer Map OL24, The Peak District White Peak area. This walk is done clockwise. Start point: Free lay-by at Curbar Gap. Curbar Gap is north of Baslow in the White Peak area of the Peak District. To avoid Sheffield city centre from the M1 take junction 36. At the roundabout take the 2nd exit onto the A61. At the main t-junction turn left still on the A61. On the dual carriage way turn right at the 2nd roundabout onto the A6101 at the end turn right onto the A57 towards Glossop and then turn left at Ladybower Reservoir onto the A6013. After passing through Bamford continue to the T-Junction. Turn left onto the A6187 for Hathersage. In Hathersage take the B6001 after about 2.5 miles turn right onto the B6521. Turn slight left onto B6001. Turn left onto A623. Then take a left turn and a right turn for Curbar continue to follow road onto Clodhall Lane. After about 0.5 miles the free lay-by parking is on the left and Curbar Gap Pay and Display car park is a little further on. Parking: limited free spaces in the lay-by and a pay and display car park £4.50 for all day. There are no public toilets the nearest ones are at Baslow. For facilities there is the Grouse Inn on the A625 at the half way point of the walk.